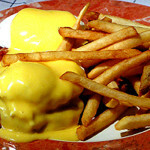 Hollandaise is one of the most classic of sauces and is one of the most famous from the French kitchen. Buttery and tangy with a little lemon its perfect for most fish dishes, most vegetables and is particularly good on green and white asparagus. My favorite is Eggs Benedict. But I make this sauce relatively often because of it versatility and it will make almost anything you put it on an indulgence . Hollandaise Sauce - Makes about 2 cupfuls, enough for 8 people on fish or 6 people for Eggs Benedict. Hollandaise is one of the most classic of sauces and is one of the most famous from the French kitchen. Buttery and tangy with a little lemon its perfect for most fish dishes, most vegetables and is particularly good on green and white asparagus. My favorite is Eggs Benedict. But I make this sauce relatively often because of it versatility and it will make almost anything you put it on an indulgence . Melt the butter and set aside in a pitcher or bowl. A pitcher is better if you have one because you will need to pour with one hand and whisk with the other. The butter should be very warm but not too hot to touch it with your fingers. Take a heavy medium size tall pot and a bowl large enough to sit on top to make a double boiler. The bowl should sit over the hot water never in it. Bring about 2cm. (1inch) of water to just before boiling point. (the water should never boil). In the bowl place the 3 egg yolks and place bowl over - not in the hot water in the pot. With a whisk, whisk the egg yolks until they become thick looking. This should take about 1 minute, (if your egg yolks were room temperature), then remove the bowl to the counter and whisk in the lemon juice and the cold water. Turn the heat down your coming back to it soon. Remember the water should never boil. You need to know that if the egg yolks get too hot they will scramble and be good for nothing. So take care. Now place the bowl over the hot water again and with one hand whisk and with the other pour in the butter a small spoonful at a time, incorporating the butter into the eggs before adding the next spoonful. An electric hand held whisk turned on medium speed is really helpful to do this. You need to keep an eye on the water in the pot and the bottom of the bowl. Lift it occasionally and touch the bottom of the bowl to see if it is getting too hot. You can keep a large bowl of cold water on the side to dip the bowl into if you think it is getting to hot and the eggs will scramble. Keep adding the butter a bit at a time until all the butter is incorporated and remove it from the hot water. Remember the bottom of the bowl is still hot. The sauce should be warm to the touch. Season the sauce now with salt and white pepper and you can add a spoonful or two more lemon juice if you like now. If the sauce looks too much like mayonnaise it is not a problem whisk in a spoonful at time of warm water to it to thin it out a bit. You can hold this sauce up to an hour by keeping it in a pan of warm water. This method is some what easier and safer for the beginner but you can get a slightly eggy taste and different texture from the sauce. This can be done in a blender by placing the 3 yolks in the blender but you still need to heat the yolks (to avoid tasting the uncooked yolks) to thicken them before you begin. So heat the yolks for a minute over hot water, whisk in the lemon juice and water and with a rubber spatula pour and scrape this into the container of the blender. With the cover on it, turn it on to high and begin pouring in the butter through the hole in the cap of the blender in a very thin stream until the sauce becomes rich and thick. I find that doing this in the blender the eggs do not take up as much of the butter as when I do it by hand. It can be thinned a little with a tablespoon of water. Scrape out all the sauce into a small bowl and season with salt and white pepper and a little extra lemon juice if you like. If it is too thick which it usually is when done this way, whisk in a tablespoon of warm water one at a time until it becomes the desired thickness. You can hold this sauce up to an hour by keeping it in a pan of warm. 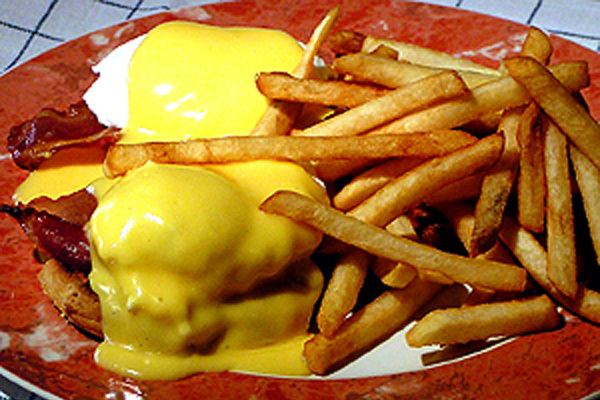 Hollandaise sauce is what is known as an emulsion. Which means that you are going to suspend the butter molecules in the egg yolks like it's done when making mayonnaise. It takes a bit of patients but is not that difficult. The results are so worth it. To make clarified butter is super easy. Simply melt butter in a sauce pan and pour into a small bowl. Put it in the fridge to become solid. Once cold, over a sink remove the solid mass of butter in one big block and under it you will find all the whey that manufacturers didn't remove from the butter. Heat the butter and you will have beautiful clear clarified butter. Indian cuisine this is used everyday and called Ghee. If the sauce scrambles or curdles.If the sauce should scramble don't panic. Its a drag but you can fix it. If the sauce should begin or look like it is scrambling, immediately remove it from the heat and place it in a bowl of cold water to stop the cooking process. Take a spoonful of lemon juice and a spoonful of the sauce in a clean warm bowl and whisk to incorporate the two. Whisking all the time add a spoonful of the scrambled sauce in to this incorporating completely before adding the next. Do this until all the sauce has been added and then add any remaining butter you might still have to add.